Barbie Dreamhouse Reviews - Dollhouses with Elevators! Barbie is the classic doll for girls. Almost as iconic as Barbie herself is Barbie’s own “dreamhouse”. As dollhouses have gotten bigger and bigger, Barbie has followed suit. There are several big, beautiful pink houses to choose from that have the typical Barbie style and design. All of these come with lots of accessories to decorate with so your princess will have all she needs to start playing house with Barbie right away! 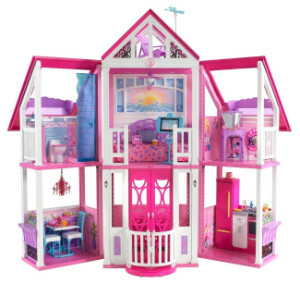 For any technology loving child, the Barbie Hello Dreamhouse is a perfect gift. (See demo video at bottom of page). Barbie products have truly moved into the technological age by launching this dollhouse on the market. The six rooms are split over two levels and various aspects of the house are activated by the Wi-Fi enabled speech recognition. Children can even customize the sounds in each room using the Hello Dreamhouse app. The dimensions of this Barbie dollhouse are 17 x 49.4 x 35 inches. The high-tech features are the main advantage of choosing this dollhouse over others as it creates a truly interactive play experience. As it is possible to customize almost every aspect of this house, children can really make it their own and this will give them hours of pleasure. The two main complaints about this product are the size and the cost. However, the dimensions of the product are clear so it is easy to check if you have enough space in your home for a toy of this size. In relation to the cost, it is more expensive than some other toys but you get what you pay for in terms of the technology. With a total of three floors and seven rooms plus a working elevator, children can make up all kinds of fun scenarios for their Barbie dolls. The garage has a door that opens and closes by sliding a tab. The Dreamhouse comes with so many accessories, the kids will have hours of fun just rearranging everything. The Barbie Dreamhouse is targeted for ages 3 and up due to the small parts that could be choking hazards. Classic rooms are made with modern designs that include the first-floor entry, kitchen, a dining room on the second floor, bathroom, and a third-floor living room. There is also a bedroom, walk-in closet, and an extra pet room. The Dreamhouse has a perfect space for keeping Barbie’s car safe and clean when she comes home. The indoor rooms have modern touches with Barbie signature designs, like the classic pink coloring. The lights, sound, and motion will entertain your children for hours on end. 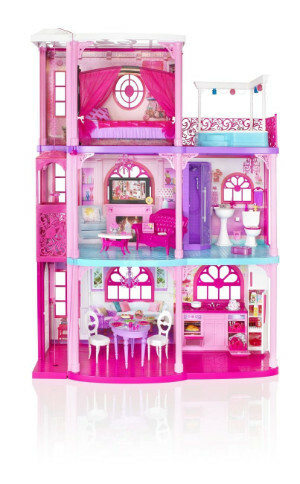 If the last Barbie Dreamhouse is an enhanced one, then this is the SUPER Barbie Dream Townhouse. 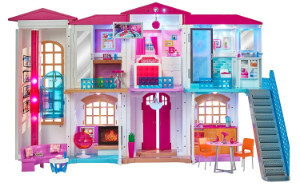 From the first floor to the third floor, the Mattel-produced Barbie 3-Story Dreamhouse has all the style and fun that Barbie has been known to supply to children everywhere. The main elevator takes Barbie from floor to floor. Some of the rooms included are a living room, bedroom, kitchen, bathroom, and even a balcony. The balcony has a hot tub for when a day has been particularly hard. Batteries are needed in order to have working lights on the chandelier, tiki lights and a fireplace. The Dream Townhouse even has sounds for a flushing toilet, a crackling fireplace, and running shower water. The dimensions of the 3-story townhouse are 30 x 7 x 32 inches and the weight is 23.7 pounds. It’s funny that this even bigger and more extravagant Barbie Dreamhouse isn’t reported as being hard to put together. Of course, that is a plus. If you can afford the price tag, this would probably be a true dream come true for a die-hard Barbie fan. 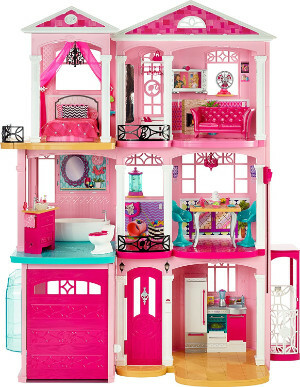 With six rooms and a sundeck over three levels, this dollhouse is in the style of a Barbie townhouse and features the famous Barbie pink in the décor of each room. Some of the interesting features of this dollhouse include a telescope for whale watching on the sundeck and an elevator to the second floor. The dimensions of the Malibu Dreamhouse are 27.6 x 11 x 22.1 inches. There are some conflicting reviews for this Barbie Dreamhouse. On the one hand, customers say it is durable and survives rough play. On the other hand, other customers have complained it is made of poor quality and cheap materials. 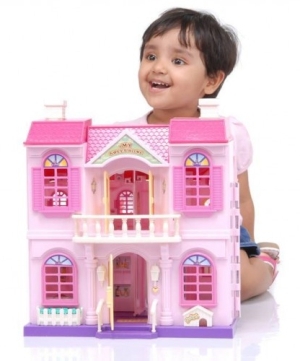 The majority of parents say their children have hours of fun playing with this dollhouse, so in terms of the satisfaction of the child, it rates highly. However, like with many of the other Barbie Dream Houses, the main downside to this product is the price. The predominant complaint about all the Barbie Dreamhouses reviewed is the large price tag. They are a pretty flashy toy to buy for your child, but they can give a large amount of pleasure. However, it is essential you take into account the negatives before committing yourself to make such an expensive purchase. On a positive note, each Barbie house comes with all the accessories needed, though not necessarily the dolls, so you will not need to buy additional Barbie furniture. If you opt for a dollhouse from a different manufacturer, you may need to buy the additional furniture that fits Barbie. Some of the Dreamhouses have received complaints about the quality of the materials. Others, such as the classic Barbie Dreamhouses, have negative comments about the complexity of assembly. When choosing which is the best Barbie dollhouse for you, make sure you check what other customers have said about the product. 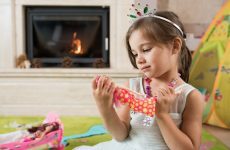 Assembly time isn’t something that should necessarily prevent you from purchasing a Barbie Dreamhouse; it just means you need to set aside enough time to complete the task. 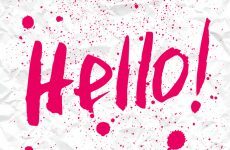 When looking for Barbie dollhouses for sale that suit children who are used to high-tech toys, then the Barbie Hello Dreamhouse is clearly the best choice. The fantastic range of features and customizable elements to this dollhouse give it the edge over any of its competitors. A final point to make is that all the Dreamhouses are intended for children over the age of three. This is because of the choking hazard due to the many small parts and this is clearly stated on the product packaging.